(Bloomberg) -- GameStop Corp. fell 5.1 percent to $10.40 a share Wednesday, the lowest intraday since April 2005, as GameStop heads toward its second day of declines. 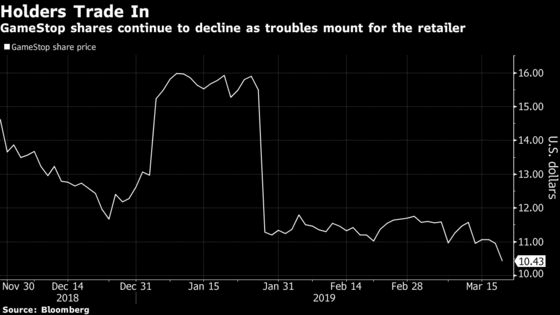 The selloff comes one day after Alphabet Inc.’s Google unveiled plans to debut a streaming service for video games later this year. Oppenheimer analyst Andrew Uerkwitz said in a note to clients the announcement is one of those "times we’ll look back at and call a turning point." GameStop has fallen 25 percent since it last reported earnings and a shift towards hardware in late November. experience is a bad one. Video game publishers including Electronic Arts Inc., Activision Blizzard Inc. and Take-Two Interactive Software Inc. are also noticeably weak during intraday trading.